A clear date for the long-awaited general election, set for March 24, has lifted consumer sentiment for the first time in five months. The latest survey by the University of the Thai Chamber of Commerce (UTCC) found the consumer confidence index picked up to 80.7 last month after dipping to 79.4 in December, 80.5 in November, 81.3 in October, 82.3 in September and 83.2 in August. Thanavath Phonvichai, vice-president for research at the UTCC, said easing of the trade war between China and the US and a return of Chinese tourists also helped boost consumer sentiment. Improving prices for many agricultural products also resulted in higher consumer purchasing power, said Mr Thanavath. Nonetheless, the indices remain lower than 100 points, which reflects lingering concerns about overall economic prospects. "An exact general election date resulted in higher confidence among both local and foreign investors. An election will improve the country`s image, drawing more capital inflow and attracting investors to the Eastern Economic Corridor," he said. 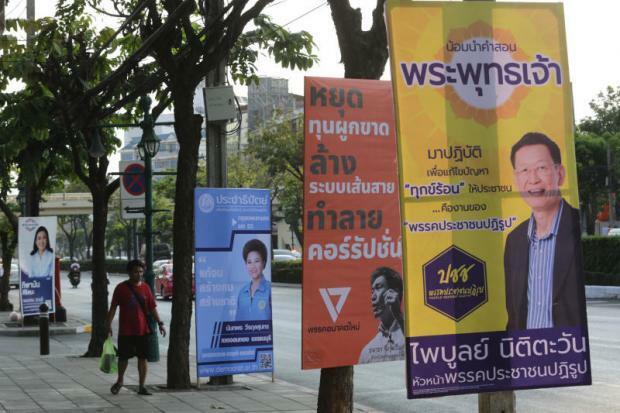 The university estimated 30-50 billion baht would be circulated during the campaign, boosting economic growth by 0.3-0.5%. Possible GDP growth this year is in the range of 4-4.2%, said Mr Thanavath. He warned that consumers are still concerned about the uncertainty of growth prospects, the risk from a trade war and the Brexit mess that may affect the world economy. Additional obstacles are low rubber and oil palm prices, as well as the domestic political situation. "We expect consumers to stay cautious of their spending in the first quarter this year," said Mr Thanavath. In a related development, another UTCC survey on spending during Valentine`s Day found sentiment to be sluggish. Spending was estimated to contract by 3.17% this year to 3.7 billion baht, the lowest in three years. Mr Thanavath said digital technology has changed the way people express their love. Thais are expected to express their affection more through online channels, he said.